It was a cold but sunny morning in the park by the 100acre wood. Owl had retreated to his tree. Piglet, Rabbit, Eeyore and the Roos had scarpered to the local café for breakfast before the parkrunners arrived. 228 walkers/joggers/runners and 18 volunteers gathered, excited for the morning that promised CAKE and celebrations. Expectations were high that they would get to witness milestone runs. 100 each for Sue Thorpe and Mags Bradbury (visiting from Bramhall) and 250 for Tigger. Tigger had been known to say that Life was not about how fast you run or how high you climb, but how well you bounce. Well, Fastrunner Tobin disagreed and ran and ran and ran all the way to his first, first finish and a sparkly bright new PB. 50 others also disagreed and there were a lot of happy pb parkrunners at Marple. But we need to remember that the wonderful thing about Tigger is Tigger’s a wonderful ED! His top is made out of rubber, his legsis are made out of springs! He’s bouncy, trouncy, flouncy, pouncy, fun, fun, fun, fun, fun. The wonderful thing about Tigger is Tigger’s a marvelous chap! He’s loaded with cake and beers and loves to run round 2 laps! He’s jumpy, bumpy, clumpy, thumpy, fun, fun, fun, fun, fun! But the most wonderful thing about Tigger is Jezza’s the only one. He’s, the only... oof! Ouch! Hey! Who put that spiky shrub there….who pushed me over…wha!? There is a strange, slightly magical correlation between parkrun beginning and the rain stopping, but today there was no such magic. Waves lapped over some paths on the course and the coast guard were on standby. One of the volunteers wore his boating jacket with a high vis top so that we could be spotted should we need rescuing. However, I still have faith in this parkrun magic, as, when Brian, a person at the very heart of Marple parkrun as both a long term volunteer and runner, came around the corner, the rain seemed to politely wait until our pre event setter upper had finished. In less rainy news, we had our 600th volunteer today! The tail walker also showed off their new fox tail. One of our marshals reported that dogs keep trying to jump into the river, perhaps in preparation for the hotter weather that is soon to come? Marple parkrun started on 26th May 2012. Since then 6,385 participants have completed 56,327 parkruns covering a total distance of 281,635 km, including 8,364 new Personal Bests. A total of 605 individuals have volunteered 5,857 times. Today began drizzly and wet, but undaunted, 142 people from 11 different clubs turned out to run, jog and walk the course, 8 of whom were first timers! The bogs of doom have still not come this year, and there is talk of them being gone permanently. Despite the slippyness of the course, 7 people recorded a new personal best time. This will have been helped by the boost in morale as the rain stopped just before the run and kindly waited until everyone was finished to begin again. The high vis heroes this week were; Brian PLATT • Marion LESTER • James KEMP • Catherine HARRIS • Miranda GALLOWAY • Jeremy WOODHAM • Hannah DUNN • Angela MOORE • Patricia RAINSBURY • Linda AMOS • Rebecca COX • Esther HARRIS • Andrea ROWSON • Matthew HOWLING • Richard HEMINGWAY • James MANUEL. These roles extended further this week as James Kemp tested out a new volunteer role for parkrun UK, and was our first ever course checker. There was also a daring rescue of a small orange cone that fell into the river. The male record continues to be held by Andi JONES who recorded a time of 15:29 on 12th July 2014 (event number 110). The female record is held by Elizabeth APSLEY who recorded a time of 18:41 on 8th April 2017 (event number 256). The Age Grade course record is held by Angela OLDHAM who recorded 93.21% (22:05) on 26th May 2018 (event number 317). Marple parkrun started on 26th May 2012. Since then 6,349 participants have completed 55,839 parkruns covering a total distance of 279,195 km, including 8,302 new Personal Bests. A total of 599 individuals have volunteered 5,806 times. Big thanks, as ever to our fabulous volunteers for making Marple parkrun happen again, including Geoff Thorpe for the Run Report. Wondering about having a go? Come and have a chat one day, no pressure but we would love to see you in Yellow. After a horde of New Year's Day Doublers had helped Marple to a record shattering 455 parkrunners, enabled by 22 volunteers, today's attendance was bound to be more modest. Even so a gratifying turnout of 222 runners and 21 priceless volunteers met up at Brabyn's Park, despite what the Met Office describe as "Anticyclonic Gloom", and what the rest of us describe as "Murky, but at least it's not raining!" Thirty participants were lining up at Marple for the first time, including the 16 of these making their parkrun debut (especially 4 members of the Charlesworth family, so a special shout-out to them). Visitors were welcomed from Wythenshawe, Warrington, Preston, Cuerden Valley, Newcastle, Bramhall, Stretford and Bolton. Twenty three different clubs were represented in today's field. Congratulations go to Steve McCombe and Alan Stevenson, both starting their 250th parkrun, and very special congratulations to Edith Rose on her 100th (in addition to her 41 junior parkruns) at the age of just 10! In what may be the clearest evidence yet of Climate Change the infamous Marple Mud still hasn't made any meaningful appearance; one visitor actually expressed disappointment at missing out on this widely reported experience (and therapeutic properties)! However, we were able to provide a worthy replacement "feature". Welcome to the Marple Molehills! Hundreds of them, spread throughout the first half of each lap, ready to trip up the carelessly placed foot or turn the unprepared ankle. Thankfully, the title of this report refers to the underfoot conditions and not the participants. No significant mishaps were reported as a result of these (or any other) hazards, and all starters completed the course safely, registering 19 new PBs in the process. Some rain is forecast for the next few days so the much missed mud may make its delayed reappearance by Saturday morning. Whether that will deter the moles ... ?? Hint from one who knows- the further back you are in the field, the more molehills will have been flattened by the time you get there! Additional.....we do love our volunteers, and it's mainly through the Friends of Brabyns Park that the park stays as beautiful and clean as it does - they need help too.....If your resolutions involve turning over a new leaf, there are plenty in the park needing attention, so why not come along and join the monthly activity days, every 3rd Saturday morning, 10am till noon. Just a couple of hours a month can make a difference to the park, as well as boosting your fresh air intake and promoting the feelgood factor of doing something environmentally friendly. Family and friends welcome, under-16s require an accompanying adult. Diary date - next activity day is Sat Jan 19. First, foremost and most importantly, I want to say a massive THANK YOU to all of the people who have volunteered and helped make Marple parkrun what it is. We cannot put the event on without your support and, every week, come sun/rain/snow/mud/heat/cold – whatever the weather, you come forward and help make this happen. Simply put, you are fantastic, THANK YOU. If you’ve not tried this parkrun volunteering lark before and are still looking for a New Year resolution, then sign up for the emails through your profile and come and play. It’s fun. Now, we knew that we’d get a few extra participants today, our previous top 4 attendances have been on NYD, but you came out in force – 455 lovely parkrunners supported by 22 volunteers – and smashed it. Almost 20% increase (always rounding up before you get all purist on me) from 382 last year and many doing a double with either Glossop or Lyme. Personal records, goals and milestones were achieved (just making it out of bed amongst them!!) with 9 new parkrunners – first time anywhere; another 124 visiting Marple for the first time – including more than 12 from Red Rose Road Runners, Preston; 42 Marple personal best times; Tracy Gregory and Ben Bradley reaching 100 runs; Emily Bamford and Chris Yates reaching 50 runs with Emily also achieving her 25th Volunteering stint! With a full complement of brilliant volunteers, the whole event ran smoothly and the back up stickers and printed barcodes got brought into play for the final 8 finishers. All of our volunteers are outstanding (often out standing in a field) and all of our fabulous DoE volunteers are given the opportunity to RD…..they’ve been amazing in the role - but the DoE - RD – NYD convergence is new! Matthew Howling, you did a fantastic job, be proud. Have a healthy, happy 2019 everyone, keep chasing those dreams. See you next week and DFYB. 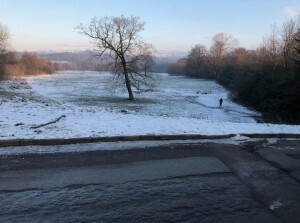 New Year's Day at Marple parkrun - 10.30 start. We have enough fabulous volunteers to go ahead (although more are always welcome). If you can, please think about walking or cycling to the event and, if coming from another local parkrun, please take care and stay within speed limits.......!! PARKING - please remember that there are limited spaces in Brabyns carparks but PLEASE park safely and only in proper spaces NOT on the verges and roads in the park. There are free carparks across the road (next to the Midland), at the Station, next to the Purple Pakora and then also in roads both in Marple and in Marple Bridge. We won't be rushing the RD briefing so please don't panic - travel safe, run/jog/walk safe. So while most of the elves were out with Santa the Gremlins seem to have got into our tech - broken timer, stubborn PC and technically inept RD - we will sort the results out, but it will be sometime tomorrow. Thanks in advance for your patience.